← What freezes faster? Cold or warm water? You would think that given a few minutes for purely recreational reading I might pick up a satisfying work of historical fiction or a glorious coffee table book full of photos of horses in exotic locales, or something… But no, I reached straight for Wise Acres, by Michael Kluckner, a memoir about a middle aged couple who sell their place in the city and buy a tiny farm not that far from Vancouver. Like any good memoirist, Kluckner (who is also an artist) can write about the most mundane of subjects and make them interesting and, even better, often funny. The creatures on his farm (sheep, geese, hens, ducks, cats, etc.) are wonderful characters, each with a personality, a history, and a particular relationship with the author. These are not numbers and quotas and pounds of meat on the hoof but sources of companionship and entertainment as much as sustenance. Of course, this means Kluckner is constantly struggling to find a way to balance his sentimental side with the practical and it is perhaps this aspect of the book and Kluckner’s story that I found most compelling. Certainly, I struggle with having too soft a heart for someone who raises animals for meat and at various points as I read I found myself nodding and sighing, thinking how much easier my life would be if I lived in the city and was a vegetarian. Kluckner spends the most time talking about his sheep operation, which was simultaneously instructive, reassuring, and a tad horrifying to someone like me who is quite new to shepherding. Woodblock prints by Kluckner illustrate each chapter (for those interested in Kluckner’s art, visit his website for more images). 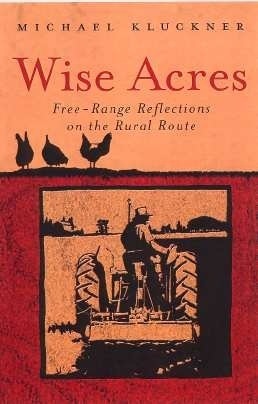 A thoroughly enjoyable read, Wise Acres will appeal to city folk thinking of moving out to the country and country folk wondering whether it might be time to cash in the sheep and return (or move on) to a more urban existence. This entry was posted in Books, Sheep, Uncategorized and tagged book review, memoir, Sheep, small farm. Bookmark the permalink. I’ve not read this one, will have to see if the library has it. I first saw Kluckner’s work through one of his “Vancouver” books, and then later, found “Pullets Surprise” at the library – a lovely book, about a year on his farm – I think the art is watercolour (it’s been a few years since I read it). My post-Christmas reading is “Wartime Farm” by the three actor/archaeologists that starred in the TV series of the same name. What a coincidence! Dad and I have that book out of the library! It’s great! Have you watched any of the show? Mine’s a library copy too :). I youtubed the show – we don’t do cable. Yes, the TV series is worth watching. I don’t believe the library has the DVD set yet, though they do have Edwardian Farm (lots of holds).